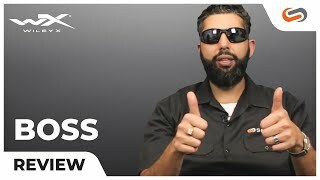 Wiley X Boss sunglasses are sleek and unique. The stylish gloss black frame on the Wiley X Boss are equipped with shatterproof selenite polycarbonate lenses that meet ANSI Z87.1-2010 High Velocity and High Mass Impact Standards as well as US Federal OSHA Standards, and have a T-shell lens coating to resist scratching in extreme environments. These Wiley X glasses feature a removable facial cavity seal to protect your eyes from fine dust, pollen, and other eye irritants. You won't feel better, feel safer, or see better than you would while wearing Wiley X Boss prescription sunglasses.